We have been using for more than 50 years to polish mechanical parts that do not require as much gloss as mirror polishing. When you arrive at buff, powder scatters in the opposite direction. It was taught that it will save even a little if it is made to receive it with abrasive. This review is about item#8703877. 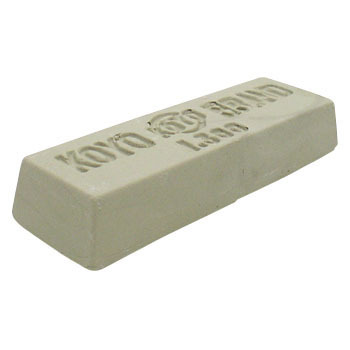 This white bar of Koyo-shi ~ Blue stick of Koyo-shashi ~ Finally, the powder gloss finish is dissolved with water and buffed, but it is reasonable use feeling. It is a feeling that it is not too hard and not too soft. This review is about item#08703877. It is user-friendly product! I definitely want to purchase again. It was big enough to open a burst for a moment. Although it is sufficient for 1/4 size, it will be helpful for the time being because it does not bother me. Also after the blue rod after work. When attaching to a disk and polishing, it was easy to work with less scattering. It is convenient to use from small scratching to # 400 finishing.